Barack Hussein Obama proves himself worthy of the Nobel Peace Prize! President Barack Obama is quietly deploying an extra 13,000 troops to Afghanistan, an unannounced move that is separate from a request by the US commander in the country for even more reinforcements. The extra 13,000 is part of a gradual shift in priority since Obama became president away from Iraq to Afghanistan. 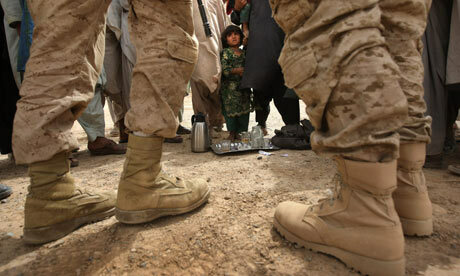 The White House and the Pentagon both announced earlier this year that the number of US troops in Afghanistan was to be raised by 21,000, bringing the total at present to 62,000, with the aim of 68,000 by the end of the year. But the Washington Post, based on conversations with Pentagon officials, said that on top of those an extra 13,000 “enablers” are also being deployed. They are mainly engineers, medical staff, intelligence officers and military police. About 3,000 of them are specialists in explosives, being sent to try to combat the growing fatality rate from roadside bombs. The deployment of such non-combat troops is in line with the professed aim of the new US commander, General Stanley McChrystal, to try to win the hearts and minds of the Afghanistan population. In addition to the deployments under way, McChrystal has also requested an extra 40,000 troops he says are necessary to prevent the country falling into the hands of the Taliban. That request has provoked an intense debate within Washington, with some political advisers in the White House opposed to any further escalation of a war that is already proving unpopular at home. The Afghanistan president Hamid Karzai, today expressed support for McChrystal’s request. “I’m fully behind him for what he’s seeking in this report,” Karzai told ABC’s Good Morning America. As part of the internal debate, the US defence secretary, Robert Gates, who is cautiously supporting McChrystal, is due to meet later today the vice-president Joe Biden, who is opposed to the troop increase and favours a shift in priority to tracking down al-Qaida in Pakistan. A decision on McChrystal’s troop request appears to have been postponed for a few weeks. Any extra troops will come as a result of a parallel reduction in the number of US troops in Iraq. The US spokesman in Iraq, Brigadier General Stephen Lanza, said yesterday that the number of US troops in Iraq will be down to 120,000 by the end of the month, down 23,000 since January. But any further large-scale reductions will have to wait until after Iraqi elections next January. He said the aim was to get all combat troops out of Iraq by August, leaving 50,000 troops to advise and support the Iraqis.